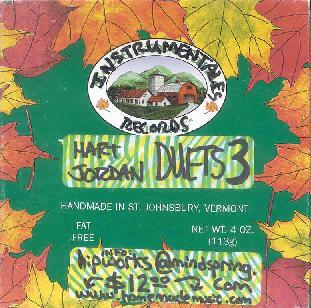 Bret Hart & Bob Jordan - "Duets: Volume 3"
Bret Hart & Bob Jordan team up for their third collaboration in Bret's Duets series and offer up 18 tracks of playful fun with an imaginative combination of sounds and styles. The performances are mostly slow and considered, many of them creating a sort of meditative effect, and others sounding like ideas intended as parts of larger works. Some parts conjured up images of Fripp & Eno performing in Mr Roger's Neighborhood. The Wurlitzer piano & guitar combination is one of the highlights for me, each playing its lazy melodic phrases in parallel with the other. Track 5 (I don't have titles) is representative of some of the best of the album with its pulsating piano lines and frisky melody, which contrasts nicely against the warbling avant-Blues acoustic guitar. Overall it's an enjoyable jam fest that free-improv/experimental fans will get into, and includes lots of the really cool sound creations and the kind of atmospheric focus that made Volume 2 so interesting. Overall, it come across as a continuous string of good ideas rather than an album that flows smoothly from beginning to end, though the free-wheeling and often playful jam quality is very loose and you can tell the musicians are really letting go. I'd like to submit a Duets wishlist item for Bret and Bob to do some more extended pieces that take an idea and develop it at length. Lots of exciting possibilities. For more information you can visit the InstrumenTales web site at: http://hartsongs.tripod.com/bret_hart_page1.htm. Contact via snail mail c/o InstrumenTales Records; 428 Patrick Street; Eden, North Carolina 27288.